Since its foundation in Paris in 1951, the ESO has graduated students from 30 different countries and has spearheaded the growth of osteopathy across Europe. Much of the School’s current reputation and continued success is due to the firm foundations laid down by Margery Bloomfield, who co-founded the School along with her former husband, the late Tom Dummer DO. 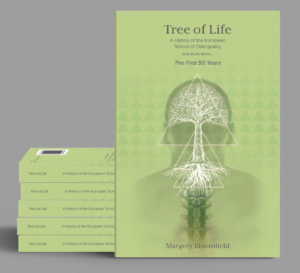 Margery has put her experiences and reminiscences into a fascinating book, Tree of Life, in which Margery looks back on the the School’s first 50 years. Full of anecdotes and photographs, it is a fascinating story of how even the most challenging problems can be overcome with dedication, enthusiasm and determination. We are delighted to say that Margery has signed the rights to her book over to the ESO, with all proceeds from sales going towards a Study Fund for students. To purchase a copy of Tree of LIfe please click on the adjacent image or contact the Library on 01622 671558 / esolibrary@eso.ac.uk. We are always grateful for donations, big or small. Plus, if you’re a UK taxpayer, donating through Gift Aid means we can claim an extra 25p for every £1 you give and it won’t cost you a penny extra. A Gift Aid declaration form can be downloaded here. If you’d like to know how you can donate please contact PA to the Executive Team, Jessica Williams, on 01622 671558 or email jessicawilliams@eso.ac.uk. Alternatively, please send a cheque payable to the European School of Osteopathy to Chancellor’s Office, ESO, Boxley, Maidstone, Kent ME14 3DZ. Please remember to fill out a Gift Aid form if this is applicable to you. Become a Trustee – we are currently looking for people to join our team of Trustees, particularly those with experience in the areas of fund-raising, legal academic management and property management. If you would like more information please contact the Executive Team Assistant, Jessica Williams, on 01622 671558 or email jessicawilliams@eso.ac.uk. As well as supporting the ESO, you’ll be assured of high quality postgraduate education – ESO alumni also qualify for a 25% CPD discount. If your an alumnus of the ESO, you can help support our work, and osteopathy, by giving a talk at your local school or college, or by acting as a contact for prospective ESO students. If you would like to help please contact Admissions Officer, Bernie Ranger. Another option is to display a poster or leaflets within your practice. To request printed copies please email us at news@eso.ac.uk or call +44 (0) 1622 760815. To find out how else you can get involved please contact our Admissions Team at admissions@eso.ac.uk.